LG Handset Showing in Verizon inventory, is it the Aloha? Phonearena.com is reporting that they have gotten an anonymous tipster sent along the image to the left. 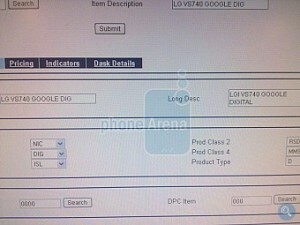 Look closely and you will see LG VS740 with Google as being listed in their system. 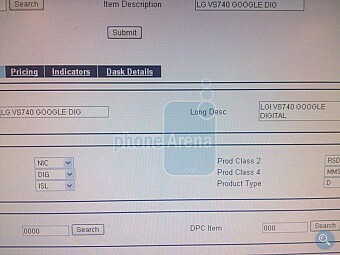 Of course there is very little other information on what handset it is exactly, but this image may be pointing to the fact that the LG Aloha is coming to Verizon Wireless. This model number popped up in the FCC testing records about a month ago. Specs are thought to include a 3.5 inch WVGA capacitive touchscreen display, a 1GHz Snapdragon processor, 5 megapixel camera, Wi-Fi 802.11 b/g/n, GPS, an optical trackpad and a full QWERTY keyboard. Additional perks are said to include support for HSDPA and DivX as well as 720p playback. Stay tuned for updates on this development.